This online exhibition explores the role of transportation in American history. Students will learn about communities wrestling with the changes that new transportation networks brought; how cities change, suburbs expand, and farms and factories become part of regional, national and international economies; and hear the stories of people who travel for work and pleasure, and move to new homes. 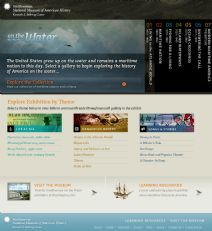 This online exhibition also includes an interactive collection search, thematic essays by museum staff and guest curators, interactive games and learning resources for the classroom and home.